KANARIE. Directed by Christiaan Olwagen. Co-written by Christiaan Olwagen and Charl-Johan Lingenfelder. With Schalk Bezuidenhout, Hannes Otto, Germandt Geldenhuys, Gerard Rudolf, Jacques Bessenger, Ludwig Binge, Francois Jacobs, De Klerk Oelofse, David Viviers and Andrico Goosen. The official blurb about Kanarie describes the plot well. 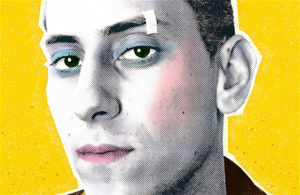 Set in South Africa in 1985 against a backdrop of apartheid, religion, and war, Kanarie follows a teen boy, Johan Niemand (Schalk Bezuidenhout), who has always been bullied in his small town for his flair for British new wave music and love of Boy George. After he gets called on by the military and auditions for the Canaries (the South African Defence Force Church Choir and Concert Group), he believes the choir will be his ticket out of fighting the war, but he begins to see the role he plays in the oppression and injustice around him. On tour, he develops feelings for a fellow Canary and he starts to question everything he knows about himself, leading to a confrontation with his commanding officers. Kanarie is a love story. A film about finding individuality in a world of oppression and uniformity. There is something really special about being at a press screening of a South African movie, particularly when you know some of the people involved. This feeling only grew as the lights dimmed and Kanarie started. I was hooked straight in to the time and its place. The very first scene in a suburban lounge was filled with familiar nostalgic objects. Then the characters spilled outside and the wrought iron garden furniture was the exact same that we had on my parent’s patio. That’s the thing about the characters, set, location and theme of this movie. If you are white and grew up at that time (Charl-Johan Lingenfelder was born in 1966 and I was born in 1965) everything is deeply, achingly, shockingly familiar. Even though I grew up in Joburg, and I was a girl, many of my friends and contemporaries were conscripted at the exact same time and grappled with the exact same horrors. Some didn’t make it out. This script is powerful, lyrical, funny, and incredibly well observed. The strong and bold choices to straddle the worlds of naturalism and stylisation is pulled off, and the story (a coming of age, coming out, love story set against the backdrop of the insanity of white apartheid South Africa) feels fresh and original because of the script. The cast and performances are superb, from the lead, Schalk Bezuidenhout, to the hilarious and delicious cameos of Anne-Mart van der Merwe and Jennifer Steyn, every single actor is perfect. Special mention must be made of Jacques Bessenger as Reverend Engelbrecht. The styling of this movie is also perfect: the deliberate and posed stills, the highly choreographed long shots of school halls, border camps, the strange and oppressive small town homes, the omnipresent old South African landscape with flags, pink overalled maids, wooden panelling and leather bound chairs that take you there. So much so, that the horror of the war is perfectly articulated in just two still images that shock, terrify and remind. But it is the references to music; Culture Club, Kate Bush, Duran Duran, David Bowie, our own Leslie Rae Dowling, that doubled the resonance for me. Some of that music was my music. Some of it was my brother’s. Some of it was my Charl’s, whose army stories I heard tell, over and over and over again. Kanarie articulates the terrible heartache of trying to navigate the personal in an environment created for the flourishing of the conventional, the religious, the state, the rules. We can only look back at that time through the fractured lens of art. This is a ‘troepie’ story with a difference, and it has a poignant and special place in the telling of our warped and cruel history. Congratulations to the massive team who pulled this off with such success.